As news spreads of Raphael’s Renaissance masterpiece, The Small Cowper Madonna, arriving at the Worcester Art Museum on loan from the National Gallery of Art, some may be interested to know that there is a related story of a Renaissance masterpiece temporarily departing from Worcester’s collection. 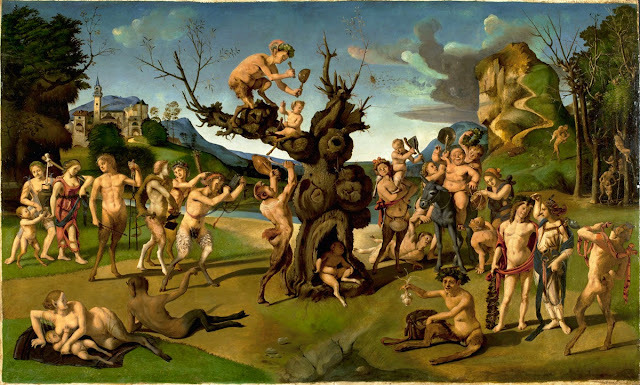 The Discovery of Honey by Bacchus, the much loved and highly imaginative painting by Piero di Cosimo (1462-1522), will be featured in the upcoming exhibition Piero di Cosimo: The Poetry of Painting in Renaissance Florence, scheduled to run from February 1 – May 3 at the National Gallery of Art in Washington, D.C. The exhibition will then travel to the Galleria degli Uffizi in Florence, Italy where it will be on display from June 23–September 27. In preparation for this major exhibition that is being billed as a ‘once in a lifetime Piero di Cosimo retrospective’, I recently spent considerable time in the museum’s conservation department treating the painting to improve its appearance and ensure its safe travel. The treatment included selective removal of upper layers of synthetic varnish that had developed a hazy appearance since their application in 1971 and 1985. An underlying thin layer of natural resin varnish was left in place and a new conservation-grade varnish was applied in order to achieve the proper saturation and surface sheen. The treatment also included inpainting minor losses and past retouches that had discolored. By reducing the visual impact of the losses and discolored retouches, viewers can now appreciate more fully the illusion of depth, form, and clarity of detail achieved by the artist. In addition to the conservation treatment, museum preparator Trevor Toney worked with the conservation department to equip the painting with a sealed climate chamber to ensure that proper preservation conditions be maintained throughout its travels. The appearance of this treasured and important painting is now much improved and the painting is certain to be a highlight while on exhibit at the NGA, the Uffizi, and again at WAM upon its return in the fall of 2015.